Gobble ! ! Gobble ! ! For close to 60 years, Nanaimo Fish and Game has been holding their popular Turkey Shoot. And : NO ! We do not shoot Turkeys. The fun starts at Saturday Dec 10 @ 9:00 AM, with several Skill Competitions. The $ 8 Trap events are fun to watch, and more fun to shoot. The ever popular Bush Wacker , 5 Spot, and Annie Oakley, test every skill level. And along with the chance to bag a Turkey, you get bragging rights for a year. But : The better you shoot …. the harder it gets. !!$%^&^&**&!! Pistols and ammunition are provided, PAL not required. Cost is $ 5 per round. .22 LR Bench Rest Squirrel Shoot at 20 yds. Rifles and ammunition are supplied. No License necessary. Cost is $ 5 round. 100 yd Centre Fire Open sight, Free Standing, Silhouette Elimination matches. 200 yd., CF, Any Sight, Free Standing Silhouette Elimination matches. Cost for each event is $ 6 per round. Come in from the cold, and take a chance for a Turkey with one of our Licenced Gaming events, enjoy the Hot Concession, browse the Baked goods on sale, pick up a book or a beautiful hand crafted gift for someone. the Archers hit the field early with Registration from 8 AM to 9 AM for a 9:15 start on the 3-D Trail. Entry Fee is $20 per adults, Juniors $10, Cubs are free, and a family can shoot for $ 35. The Rest of the day is the same as Saturday. So come out. 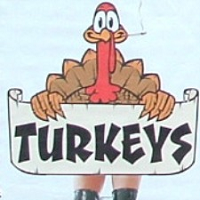 Have some fun, and maybe win a Turkey.